BEREA – Davone Bess and Travis Benjamin – the “undersized” receivers – went the six offseason practices open to the media without a dropped pass of note. Speed has never been an issue for Benjamin (5-10, 175), but he improved his route-running and catching since his rookie season. Weeden said Benjamin may have led the team in receptions in the 16 offseason practices, and he finished with two long completions from Weeden on Thursday. “His route-running is phenomenal, probably because he’s so fast,” Weeden said. “Guys have to honor him running by them. He’s been getting in and out of breaks so well. 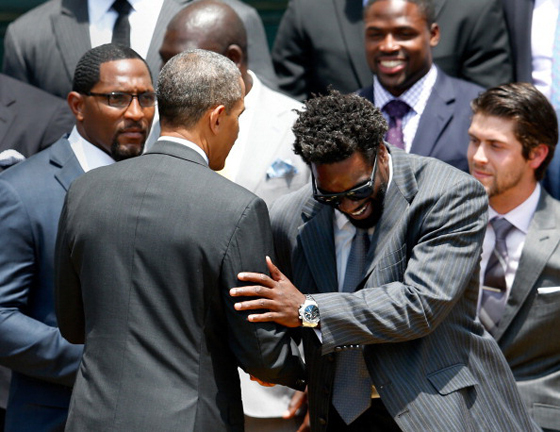 Texans safety Ed Reed celebrated the Ravens Super Bowl season by rejoining his old team for a White House visit. President Barack Obama made a crack about how old Reed looked. Reed was on the NFL Network’s NFL AM this morning and they were kind enough to share a transcript that included this section regarding his time with the president. 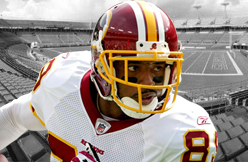 Redskins veteran receiver Santana Moss carries a workmanlike attitude into every practice, and still takes joy in beating defensive backs that are many years his junior. While the team was practicing goal line drills today, Moss beat triple coverage in the end zone for an easy touchdown from quarterback Kirk Cousins. There is a reason why Moss led the team with eight receiving touchdowns last year: he just knows how to get open. In a limited role, typically in relief of the since-departed Reggie Bush, Lamar Miller was an explosive, change-of-pace back last season, averaging 4.9 yards per carry. Now, heading into his second season, Miller appears ready to take over as the team’s full-time starter, earning confidence from Ryan Tannehill and others this offseason. While he’s ready to help a Dolphins’ reloaded offense try to put up more points this year, personally, he has a number in mind. It’s quite an audacious goal, one that the second-year running back will need a combination of skill, opportunity and, yes, luck to accomplish. For one, the NFL isn’t what it used to be; teams are throwing more than they ever have before. Six of the seven highest single-season totals for pass attempts by a quarterback have occurred the last three seasons. When teams do run, they — to the chagrin of fantasy owners everywhere — are more likely to spread carries around — we are in the running back-by-committee era. To put it in a numerical context: running backs have eclipsed 1,500 rushing yards just ten times during the past six seasons (2007-12); there were 27 1,500-yard seasons in the six years prior to this stretch (2001-06), though. The question — if Miller can prove to be effective as a starter — is whether he will get enough carries. The four running backs that rushed for 1,500 yards in 2012 — Adrian Peterson, Alfred Morris, Marshawn Lynch and Jamaal Charles — combined to carry the ball on an average 32.2 percent of their team’s plays. Compare that to Bush, who only carried the ball 23.1 percent of the time in the Dolphins’ West Coast offense last season, and it may be tough for Miller to get enough attempts this year, especially with Daniel Thomas and Mike Gillislee helping out. But if the additions of Mike Wallace, Brandon Gibson, Dustin Keller, et al. open up running lanes for Miller, and he gets enough opportunities, the Dolphins running back, a potential fantasy sleeper, could give 1,500 yards a run. Mike Shanahan typically tries to avoid heaping praise on individual players. But the Redskins’ head coach made an exception when asked recently about third-year wide receivers Leonard Hankerson and Aldrick Robinson. Hankerson established career highs last season for receptions (38), receiving yards (543) and touchdowns (3). But what has Shanahan excited is the fact that the 24-year-old has finally had an an entire offseason to hone his route running and refine other details of his game. 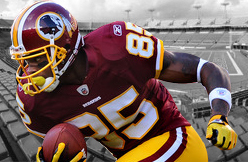 In 2011, the five-month lockout erased Hankerson’s first offseason in the NFL and, as a rookie, he played in only four games before landing on injured reserve with a hip injury. 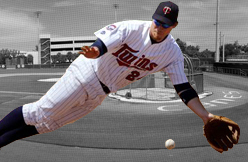 In 2012, he spent most of the spring and summer watching from the sideline as he rehabbed from surgery to repair a torn hip labrum. Hankerson made five starts and appeared in all 17 games last season and, as of now, figures to enter training camp next month fourth on the Redskins’ depth chart behind Pierre Garçon, Josh Morgan and Santana Moss. “He’s in shape. His weight is the right way,” Shanahan said of Hankerson, who is listed at 6-2, 211-pounds. 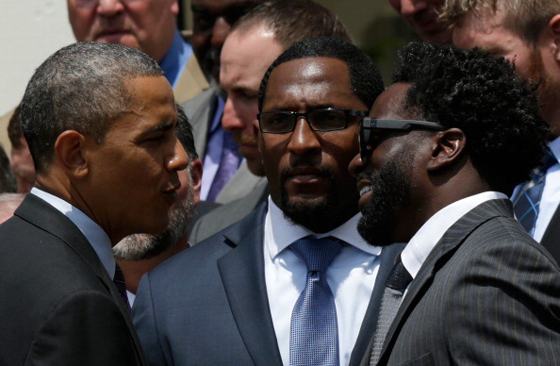 “He’s getting some valuable reps."
If former Ravens center Matt Birk had opted to join his former teammates at the White House, he may have gotten what former Ravens safety Ed Reed got from joining his former teammates at the White House. “It was really awesome getting back and seeing my teammates,” Chris Farley Reed told NFL Network earlier today. “It was like closure since I had not seen them since I had signed. I know they had a lot of questions and they were answered yesterday. That whole team, all those guys, they know me. They know I always tell them to understand this business when they first come into the league as rookies. I talked to just about all of them. I talked to them about being professionals, having some professionalism about themselves, how to carry themselves. So they understand the business. Whoa. No one ever said Reed’s unexpected hip surgery, due to an injury he apparently didn’t disclose to his new team, could keep him out for the regular-season opener. Based on what Reed has now said (he actually let the cat out of the bag for the first time on Wednesday), it apparently could. 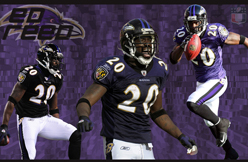 It’s a good thing the Ravens are too dumb to realize they should have re-signed Reed. INDIANAPOLIS -- Reggie Wayne was back in Indianapolis on Wednesday putting names with faces, getting acclimated to about three dozen more new teammates, working with another new offensive coordinator and, yes, learning a new offense all over again. "The last few years my main focus on Day 1 has been just getting to know my teammates, getting to know their names, getting to figure out where everybody comes from and then going into the playbook because at the end of the day, you are out there with them and they are out there with you and you are doing whatever you got to do for each other. So I think it would be bad to go out there and not know the guy next to you, his first and last name," Wayne said. "It has been a challenge, but I'm getting it done. It's a little new to me still, but it's cool." From 2002 through 2011, Wayne didn't have to endure anything like this. Peyton Manning was the starting quarterback, the offense was never overhauled and the roster was laden with veterans the Colts drafted, developed and kept. Back then, the expectations rarely changed.But after neck surgery shelved Manning for the 2011 season, Indianapolis completely rebuilt. Since last showing up in the Colts' locker room following a playoff loss to Baltimore in January, Wayne has lost another old friend, Dwight Freeney, who left for San Diego. Nine veteran free agents have joined the roster along with seven draftees and new coordinator Pep Hamilton, who took over after Bruce Arians accepted the head coaching job in Arizona. Hamilton called the plays for Andrew Luck at Stanford and now both are trying to teach the system to the rest of the Colts, including Luck. "Reggie looks great," Luck said after Wednesday's practice. "Reggie's going to look great in whatever offense you put him in. If it's the spread or whatever that crazy A-11 thing was in high school a couple of years ago, whether it's backyard football, any sport. He's the type of guy that stands out. He's just an athlete. He knows how to play. He'll be great. He always is." That's why the Colts have rarely balked when the 34-year-old Wayne takes his offseason workouts on the road. Traditionally, Wayne has spent the offseason like many former Hurricane players -- sweating in the South Florida heat. Each year, Wayne returns in exceptional shape and has been incredibly productive for a receiver his age. He's had four 100-catch seasons in the last six years and has topped the 1,000-yard mark every year since 2004, missing by just 40 yards in 2011 when Manning did not play. Last summer, he even brought Luck to his home base to teach him what it takes to excel in the NFL. Apparently, it worked as the Colts rebounded from a 2-14 season to go 11-5 and reach the playoffs with one of the biggest turnarounds in league history. "I went to the University of Miami, man. We didn't cheat. We did everything the right way," Wayne said. "So we just go take it one day at a time. I'm sure he's in there and when he gets a better idea of some things, he'll kind of help us out a little bit." He plans to be around for next week's mandatory minicamp, and then he'll head back to Miami where he'll continue to work out until training camp begins in late July. "I think we're rolling. I think we'll definitely take advantage of the rest of the OTAs [offseason team activities] and what we have left, but mandatory minicamp will be big for us," Wayne said, noting that he learned the difference between mandatory and voluntary at Miami, too. "It'll be nice to be out there and really get going. It's been positive, productive so far. Hopefully we can finish this segment up well and go into the next one with some momentum." Willis McGahee's agents say their client has some personal family matters he's attending to. 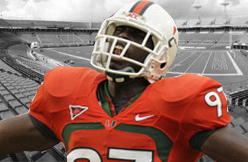 McGahee comes from Baltimore and the University of Miami, where veteran stars rarely show up for voluntary OTAs. He doesn't seem to grasp that his roster spot in Denver is in jeopardy thanks to a $2.5 million salary, last year's broken leg and the emergence of Montee Ball/Ronnie Hillman. McGahee is expected to show for Broncos' June 11-13 mandatory minicamp. 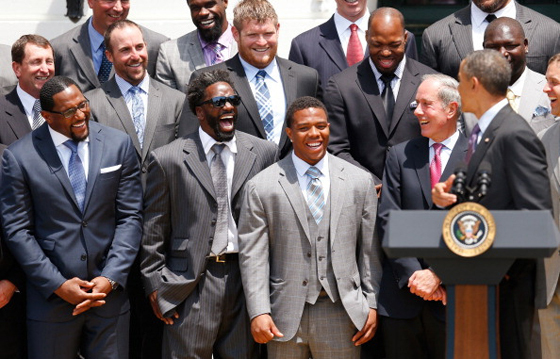 After a Wednesday trip to the White House, Texans’ safety Ed Reed was in good spirits. 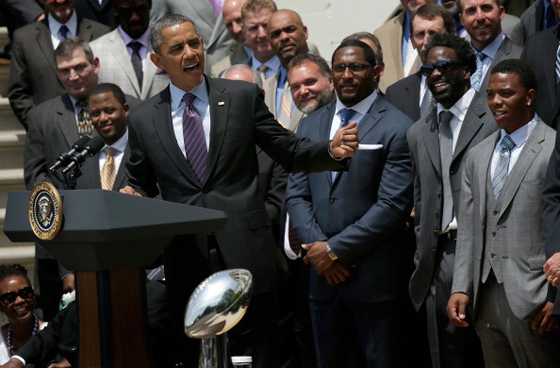 He and many of the 2012 Super Bowl champion Baltimore Ravens visited with President Barack Obama, and this morning on the NFL Network’s “NFL AM” show the 2004 NFL Defensive Player of the Year shared about the highlights of the trip. At the end of the nearly 6-minute interview, Reed talked about his new team in Houston and his ongoing recovery from a surgical procedure on his hip. Reed has been rehabbing in Atlanta, and according to head coach Gary Kubiak, will join the team for minicamp on Tuesday. In addition to his praise for the Texans’ organization and its response to his surgery, Reed also spoke highly of his head coach, defensive coordinator Wade Phillips and secondary coach Vance Joseph. Reed also described Houston as being “home”. He and the Texans will go through mandatory work at the Methodist Training Center on Tuesday, Wednesday and Thursday before taking the last long break of the offseason. Training camp will begin in late July. 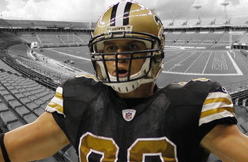 METAIRIE, Louisiana — Jimmy Graham talks about his performance last season as if it were an enormous disappointment. Forget that many tight ends would have been pleased to make 85 catches — which led the Saints in that category — for 982 yards and nine touchdowns. Those totals still represented a drop-off for the 6-foot-7 Graham, who had one the best seasons ever for someone at his position in 2011. "This is probably the hungriest I've ever been to kind of right the wrongs of last year and to prove what this team can do and maybe hush up some of the naysayers," Graham said. "So for me it's all work and doing as much as I can to be the best player I can." Graham, a converted college basketball player drafted out of Miami in 2010, became a Pro Bowl tight end in only his season NFL season, when his 99 catches for 1,310 yards 11 TDs helped New Orleans' record-setting offense rack up the most yards ever in a season with 7,474. The only tight end ever to have more yards receiving in a season than Graham is New England's Rob Gronkowski, who had 1,327, also in 2011. Graham had hoped he would only get better in Year 3, but was hampered for much of the season by a left wrist injury and also missed one game with an ankle sprain. Graham was plagued by dropped passes. And while he won't blame it on the wrist injury, for which he wore a brace, quarterback Drew Brees was certain it didn't help. "He was banged up quite a bit last year in his defense," Brees said. "He's had an offseason now to recover and be on the mend. He feels a lot better." Graham had wrist surgery after last season. Although he said he is not fully recovered yet, Graham has made several acrobatic catches in non-contact, offseason practices, including a leaping, one-handed grab on a throw to the end zone that delighted fans who flocked to open minicamp practices this week. "I've been in rehab and I've been getting stronger," Graham said. "Right now I'm almost 100 percent, so going into camp I'll be 100 percent. And it just feels good. It feels good to be healthy finally and to be back playing like me." In addition to feeling better physically, Graham said he's drawn confidence from a couple other developments. One is that Brees has been working with him throughout the offseason, which did not happen a year ago while the star quarterback was holding out for a new contract. The other is having coach Sean Payton, who designed the offense, back from his season-long suspension in connection with the NFL's bounty investigation of the club. "It feels like it did two years ago. We are right on pace and guys are learning," Graham said. "I'm definitely excited for what is going to happen this year and for everything to start to count." Maturity is another factor. For the first time, Graham enters a season as the Saints tight end who has been on the roster the longest. Gone are previous mentors Jeremy Shockey and David Thomas. "That's definitely different," Graham said. "I've always had somebody there to kind of teach me and to kind of follow them. Now it's a little bit more on my shoulders. ... I'm definitely getting a little older, I'm learning a lot more about defenses this year, and I think that's what is going to help." Notes: Payton said he has not decided who will call the offensive plays this season. In 2011, he stopped doing it after he was injured in a sideline collision in the sixth game of the season, taking more of an oversight role while the offensive coordinator Pete Carmichael called plays. Last season Carmichael again called all the plays while Payton was suspended, and the Saints' offense ranked second in total yards. "Pete has been invaluable. He has been tremendous," Payton said. "His role will be significant." Murielle Ahoure of Ivory Coast clocked a new national record on her way to pushing Olympic 200m champion Allyson Felix into second place at the Rome Golden Gala, the fifth leg in the 14-event Diamond League series, on Thursday. Last month Ahoure had clocked what was then a world-leading time of 22.47sec in Ponce, but the African made the most of the absence of several top names to clock a new national record of 22.36. Felix, the Olympic champion from London, finished second in 22.64, three tenths behind her best time of the season, 22.36, set last week in Beijing. With the world championships in Moscow the big objective this year, Felix was philosophical about her setback. "It's an interesting year for me: I'm trying to piece things together and make the team in a few weeks," said the American. "I'm taking a different approach this year, taking more time off, so I was a little off. "I'm trying to make the (US) team, run the 100 and 200 (in Moscow). "I'll stay patient. It's what happens down the season that counts." The women's 200m field was missing a number of top names including Veronica Campbell-Brown of Jamaica and compatriots Shelly-Ann Fraser-Pryce, the Olympic silver medallist in London, and Sherone Simpson. Bulgaria's Ivet Lalova finished third in a season's best of 22.78. Ahoure's win means she takes the lead of the Diamond League standings in the discipline, in which Felix is now fourth. 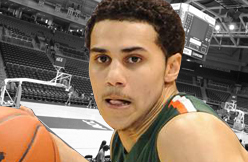 Shane Larkin knows the questions. He’s spending the days leading up to the NBA Draft on June 27 trying to provide the answers. Larkin, a 5-foot-11 point guard from Miami, worked out for the Utah Jazz on Wednesday at the team’s practice facility. One of the things the Jazz wanted to see — like other teams interested in him — was whether Larkin is capable of defending bigger players. To that end, Larkin was by far the smallest player invited to this workout. The others included three guards — 6-5 Lorenzo Brown from North Carolina State, 6-5 Malik Story of Nevada and 6-7 Reggie Bullock of North Carolina — along with forwards Tony Mitchell of North Texas State and Amath M’Baye of Oklahoma. "I was the shortest guy out there, so that’s good," Larkin said. "I had to go out and show I can play against bigger players. "… That’s one of the questions about me. Can I play against bigger guys? So it was good to go out and try to prove that I can." Since the Chicago scouting combine two weeks ago, Larkin’s stock has risen sharply. Despite his worrisome size, he demonstrated freakish athletic ability and became a player who will likely be picked in the middle of the first round. SALT LAKE CITY — Shane Larkin is a great athlete. He proved that at the recent NBA combine when he posted a vertical leap of 44 inches, the second-best mark in the history of the annual pre-draft showcase. So why didn’t he follow in the footsteps of his Hall of Fame father, Barry, and try to become a Major League Baseball player? Turns out that when he was 8 years old and trying to emulate former Cincinnati Reds players, such as Tony Perez and Pete Rose, his little league coach told him his batting form was all wrong. He followed his coach’s instructions, but wasn’t successful — so he quit baseball. “That was my last year of organized baseball — ever,’’ he said. As a result, Larkin turned to basketball, where he has excelled enough that he is projected as a likely first-round pick in this month’s NBA draft after a stellar career for the University of Miami. Larkin showed off his talents Wednesday to Utah Jazz coaches as one of six players brought to work out along with Lorenzo Brown, a 6-5 guard from North Carolina State; Reggie Bullock, a 6-7 forward from North Carolina; Amath M'Baye, a 6-9 forward from Oklahoma; Tony Mitchell, a 6-8 forward from North Texas; and Malik Story, a 6-5 guard from Nevada. Larkin apparently impressed the Jazz with his play on the floor and really impressed the media with his engaging personality in a seven-minute interview after his session. “I love being out in front of people, love talking with people, so it’s good,’’ he said. Larkin also talked about his ability to play the pick-and-roll, his outstanding jumping talent and his ability to run an offense. His more than two-hour workout with five other players was closed to the media and Jazz coaches didn’t comment on how he fared against two 6-foot-5 guards and three forwards. However, Jazz head scout Walt Perrin was complimentary of Larkin. The one concern about Larkin is his height at 5 foot, 11 inches. Only a handful of players in the NBA are under 6 feet tall. Larkin said his workout was useful because he was able to go up against bigger players and prove he can guard them. While his height may hurt his NBA prospects, Perrin downplayed it. Perrin acknowledged that not every player brought in is a prospect to be drafted. But the one other player who may be a possibility to be a Jazz draft pick is Brown, a lanky guard who was recruited by current Jazz assistant Sidney Lowe to N.C. State. Most draft boards list him among the top six or seven point guards this year. Six more players will work out for the Jazz Thursday — Marquette guard Vander Blue, Baylor guard Pierre Jackson, Notre Dame forward Jack Cooley, Minnesota forward Trevor Mbakwe, Arizona forward Solomon Hill and Georgia Tech guard Glen Rice Jr.
On Tuesday night, ESPN reported that Major League Baseball was prepared hand out stiff penalties to players implicated in the Biogenesis scandal. A list of about 20 players was included in the report. Orioles infielder Danny Valencia was not on that list. In February, Yahoo Sports obtained a document that linked Valencia to the anti-aging clinic run by Anthony Bosch. Valencia issued a denial early in spring training. The report did not link Valencia with use of performance-enhancing drugs. Valencia, who was acquired by the Orioles from Boston last November said he was shocked when his name surfaced. “I was really upset. I was trying to think of how this can possibly be. But I have nothing, I know just as much as everybody else,” Valencia said. After Tuesday night’s game in Houston, Valencia reiterated his February denial. 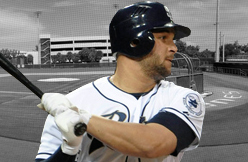 The San Diego Padres will place 1B Yonder Alonso (hand) on the 15-day disabled list with a right hand contusion Thursday, June 6, to make room for the return of OF Cameron Maybin (wrist) from the DL. 1B Kyle Blanks will remain on the roster. Jesus Guzman and Blanks could split duties at first base with Alonso out, although both hit from the right side. They're both worthy of looking at in deep mixed leagues. Alonso hasn't played since last Friday, so the Padres can back date his DL stint to allow him to return soon. DETROIT -- Indians' closer Chris Perez played catch for just the second day since he was placed on the disabled list, but he could be facing additional drug testing by Major League Baseball after police found what is believed to be marijuana in a search of his Rocky River residence on Tuesday. Perez, the Indians' two-time All-Star closer, played catch at 90 feet Thursday at Progressive Field. It was just the second time he's thrown a baseball since going on the disabled list May 27 with a strained muscle in the rotator cuff of his right shoulder. Rocky River police, U.S postal inspectors and the West Shore Enforcement Bureau found "a controlled delivery of drugs" to the home that Perez and his wife, Melanie, are renting. Rocky River police said later the substance was believed to be marijuana and it has been sent to a crime lab to be tested. Perez and his wife were not arrested and no charges were filed. As part of MLB's Joint Drug Prevention and Treatment Program, marijuana is listed as a drug of abuse. Players are not tested for such drugs unless there is reasonable cause by either the team or the players association that the player has in the last 12 months "engaged in the use, possession, sale or distribution of a drug of abuse." If the program's treatment board receives a "reasonable cause notification" from either side about a player, and the board agrees with it, the player would be tested no later than 48 hours after the board was notified. If the player tests positive, a treatment program would be provided which could include further testing. A player who failed to comply with the program or continued to fail tests could be fined up to $35,000 for each violation. The player would not be subject to a suspension. According to sources, the Indians are unlikely to pursue such a course of action against Perez even if charges are filed against him. In MLB's fight against PEDS, marijuana is at the bottom of its hit list. Perez and all other MLB players are subject to the strictest drug testing in professional spots in North America. Starting on the first day of spring training, they are tested for performance enhancing drugs, stimulants and HGH. Perez has never had a positive test. 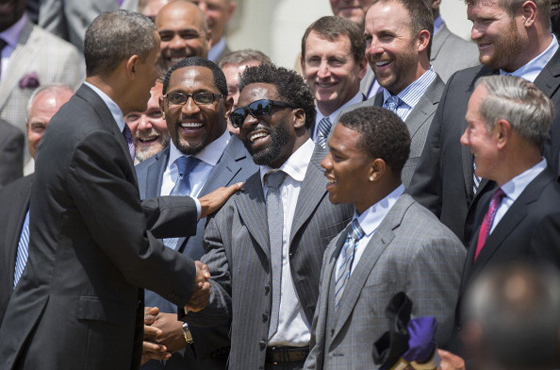 Texans safety Ed Reed was at the White House with his former team today, being honored by the President for the Ravens’ Super Bowl victory. Afterward, Reed spoke with reporters and was asked about the Texans’ Week 3 matchup against the Ravens. Reed, 34, had arthroscopic hip surgery at the end of April. That kind of surgery typically takes about three months of recovery, and the Texans are expecting to have Reed practicing again at some point in training camp. That was how coach Gary Kubiak termed it recently after an OTA session. Reed’s quote doesn’t indicate that he won’t be be available for the start of the season, but it doesn’t close the door on that, either. 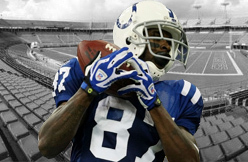 INDIANAPOLIS — Reggie Wayne feels young again. The 34-year-old receiver with six Pro Bowl appearances was back in Indianapolis on Wednesday putting names with faces, getting acclimated to about three dozen more new teammates, working with another new offensive coordinator and, yes, learning a new offense all over again. Hey, at least he knows who the quarterback is at first glance. "The last few years my main focus on day one has been just getting to know my teammates, getting to know their names, getting to figure out where everybody comes from and then going into the playbook because at the end of the day, you are out there with them and they are out there with you and you are doing whatever you got to do for each other. So I think it would be bad to go out there and not know the guy next to you, his first and last name," Wayne said. "It has been a challenge, but I'm getting it done. It's a little new to me still, but it's cool." Peyton Manning was the starting quarterback, the offense was never overhauled and the roster was laden with veterans who the Colts drafted, developed and kept. Back then, the expectations rarely changed. But after neck surgery shelved Manning for the entire 2011 season, Indianapolis completely rebuilt. Longtime leaders such as Manning, Gary Brackett, Dallas Clark and Jeff Saturday were let go. Coach Jim Caldwell and Bill Polian, the architect of Indy's decade of success, were fired and suddenly last year Wayne was starting over. Now things are new again. So far, Wayne has seemed right at home. That's why the Colts have rarely balked when Wayne takes his offseason workouts on the road. Traditionally, Wayne has spent the offseason like many former Hurricane players — sweating in the South Florida heat. Each year, Wayne returns in exceptional shape and has been incredibly productive for a receiver his age. He's had four 100-catch seasons in the last six years and has topped the 1,000-yard mark every year since 2004, missing by just 40 yards in 2011 when Manning did not play. Last summer, he even brought Luck to his home base to teach him what it takes to excel in the NFL. This time, Luck is the teacher and Wayne the pupil who is learning on the run. He's not even asking for Luck's help yet. For now, Wayne will try to figure it out himself. He plans to be around for next week's mandatory mini-camp, and then he'll head back to Miami where he'll continue to work out until training camp begins in late July. "I think we're rolling. I think we'll definitely take advantage of the rest of the OTAs (offseason team activities) and what we have left, but mandatory minicamp will be big for us," Wayne said, noting that he learned the difference between mandatory and voluntary at Miami, too. "It'll be nice to be out there and really get going. It's been positive, productive so far. Hopefully we can finish this segment up well and go into the next one with some momentum." McGahee continues to stay away from the Broncos' voluntary OTAs but is expected to report to the team's mandatory minicamp next week, the Denver Post reports. McGahee has not reported to voluntary OTAs since his Ravens days, so it's not a big surprise that he's skipping this year too. The issue this time around is that he has serious competition for the starting job from Montee Ball, Ronnie Hillman and, to a lesser extent, Knowshon Moreno. If he wants to retain his job as the starter, he's going to have to go into mandatory minicamps in good enough shape to regain his reps with the first team offense, which Ball and Hillman have been splitting, with Moreno still battling back from his knee injury. The good part of all of this is that Phillips is a smart veteran player whose track record as such merits some level of trust. The bad part, of course, is that some days his knee isn't going to let him practice or play, and it doesn't seem to offer any helpful patterns of behavior that let him know in advance when those days are going to be. This is not news to the Eagles, of course. Had it not been for concerns over the knee, it would have cost them much more to sign Phillips than it did. Heck, had it not been for concerns over the knee, the New York Giants likely would never have let Phillips hit the market in the first place. But the knee is a fact of Phillips' life, and for this year at least it appears it will be a fact of Chip Kelly's as well. Phillips is a good enough player, and the Eagles' safety position needs enough help, that the Eagles will give him a lot of rope on this. If Phillips can play at all, he'll make the Eagles' defense better when he's on the field. If he can somehow get that knee through a full 16-game season, his impact on the defense could be incalculably helpful. But it's going to be a painful, halting process no matter how it turns out, and Phillips and the Eagles are just at the beginning of it. 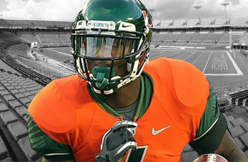 There seems to be a new starting running back in Miami, and it is someone quite familiar with South Florida. Lamar Miller has been turning some heads during spring workouts, picking up the carries that were left when Reggie Bush signed as a free agent with the Detroit Lions. And he is picking them up just fine. That is what the Miami Dolphins were hoping when they let Bush go to Detroit in the offseason. The Dolphins drafted Miller in the fourth round of the 2012 draft. The University of Miami standout has been getting the ball a lot early in the workouts, and quarterback Ryan Tannehill has liked what he has seen, saying on NFL Network that Miller was “way ahead” of the other running backs. Miller showed flashes during his rookie campaign, rushing for 250 yards, an average of nearly 5 yards per carry. But he likes what he has seen. The team still has Daniel Thomas, and drafted University of Florida running back Mike Gillislee. The Jacksonville Jaguars were tied for the worst team in the NFL last season, which means they needed a major overhaul this summer after years of decline. Despite their draft picks and free agency signings so far, they’re not done with a number of positions, including offensive tackle, with Eric Winston and Winston Justice waiting for a call. The Jags used their number 2 draft pick on Luke Joeckel of Texas A&M to become the centerpiece of their offensive line in the future, and got Johnathan Cyprien, a Safety out of FIU as their number two pick. They’ve also added nine players since March through free agency, including wide receiver Mohamed Massaquoi and cornerback Marcus Trufant. But they’re still looking for another offensive tackle, especially looking at Eric Winston and Winston Justice, two players who have been mentioned as candidates for a number of teams so far, but haven’t been able to agree on anything, although both of them, each one in his separate time, seemed to be on his way to joining the Dallas Cowboys. Another interesting addition for the Jags might be bringing back Daryl Smith, who has played for the team his entire career (since 2004), playing as an outside linebacker in the 4-3 system. Smith hasn’t been able to find work with anyone else, partially hoping he’d get a call back from the Jaguars, even if its for reduced money. Another position the Jags are still looking to fill is at Tight End. While there isn’t anyone who can bring them too much to the table, veterans like Kellen Winslow, Dallas Clark, Todd Heap and Visanthe Shiancoe, who didn’t even play for anyone last season, are still available, and looking for a team in 2013. Shane Larkin might be gone by the time the Milwaukee Bucks select 15th in the NBA Draft, but he would want the organization to pick him if possible. "I kind of had that same setup down in Miami," Larkin said. "So coming in here and running the pick-and-roll with those guys would be a lot like at Miami. It seems like a good fit to me." Larkin, 20, has studied the Bucks' personnel and said he would be comfortable playing in a lineup with Larry Sanders and Ersan Ilyasova. "Actually Larry Sanders was at VCU when coach Shaka (Smart) was recruiting me, so I knew about him," Larkin said. "I played with a stretch 4 (at Miami), so that's like Ersan." CLEVELAND -- Drug agents are investigating a suspected marijuana shipment mailed to the suburban home of Cleveland Indians closer Chris Perez, authorities said Wednesday. Rocky River Police Chief Kelly Stillman said city officers, a regional narcotics unit and postal inspectors were involved in Tuesday's daylong operation investigating a delivery to Perez's home in the lakeside Cleveland suburb. No charges have been filed and the matter remains under investigation. A message seeking comment was left for Perez's attorney. At a news conference Wednesday, the police chief said the operation likely originated with a package that appeared suspicious to postal employees. "They took it from there," he said. In a brief written update Wednesday afternoon, the police chief confirmed the shipment was suspected to be marijuana, but said that the state crime laboratory will have to confirm that. "Depending on what it was and how much it was, charges will be filed accordingly," Stillman said. Officers with a search warrant took evidence from the Perez house, according to the chief, but the seized items weren't specified. Indians general manager Chris Antonetti said in a statement that the team had talked with Perez and was "gathering additional information." Manager Terry Francona, addressing the situation before the Indians' Wednesday afternoon game against the Yankees in New York, said he had reached out to Perez to check on him. "I spoke to him this morning, called him, just wanted to make sure he was OK," he said. "Out of respect to everybody involved, that's really all I can say." The Indians' often-polarizing closer has six saves this season, but is on the disabled list with an injured right shoulder. He and Cleveland fans have gotten on each other's nerves the last couple years, and he recently deactivated his Twitter account after hearing it from fans following a couple of bad outings. In previous seasons, Perez has criticized fans for not coming to games, and ownership for not spending money on free agents. The right-hander was supposed to start throwing again this week. Francona said he wasn't sure if the investigation would affect Perez' injury rehabilitation. "I don't know. I honestly don't know," he said. "Let's not only go one day at a time, let's go one hour at a time here." 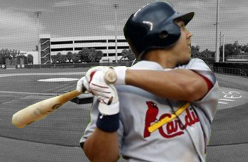 St. Louis Cardinals OF Jon Jay has only two hits in his last 37 at-bats. Right-handed-hitting OF Shane Robinson drew the start in center field on Tuesday, June 4, against Arizona Diamondbacks SP Tyler Skaggs, a left-hander. Fantasy Tip: Jay seemed to turn things around in early May following some adjustments at the dish, but another skid has dropped his average to .238, after it had reached .286 just a couple of weeks ago. If this goes on for another couple of months, the Cards may be tempted to try alternatives. They could move Allen Craig to the outfield and get Matt Adams into the lineup regularly, or they could even call up Oscar Taveras, assuming that the top prospect is healthy. NEW YORK — The founder of a Miami anti-aging clinic has agreed to talk to Major League Baseball about players linked to performance-enhancing drugs, a person familiar with the case told The Associated Press on Tuesday night. The person declined to be identified because the investigation was still ongoing. Information that Anthony Bosch provides MLB on players who came to the now-closed Biogenesis of America clinic could lead to 100-game suspensions. Alex Rodriguez, Ryan Braun, Nelson Cruz, Melky Cabrera as well as former Indians Jhonny Peralta and Bartolo Colon are among the players whose names have been tied to the clinic. The agreement between Bosch and MLB was first reported by ESPN. In addition to Rodriguez, New York Yankees teammate Francisco Cervelli also was linked to the clinic. Cervelli said he consulted Biogenesis for a foot injury, but didn't receive any treatment. "We'll let MLB handle everything and we don't really have a comment," Yankees manager Joe Girardi said after a 4-3 win over Cleveland. Girardi said the Yankees were still planning on Rodriguez rejoining the team after the All-Star break. The star third baseman has been on the disabled list all season. As for the drug cloud that has hovered over baseball for years, Girardi said: "I think we all had hoped we'd gotten through it. But obviously, we haven't." Yankees outfielder Vernon Wells said it was too soon to draw any conclusions. "Everything right now is speculative," Wells said. "We can all sit here and wonder." MLB has sued Biogenesis of America and its operators, accusing them of scheming to provide banned PEDs to players in violation of their contracts. Miami New Times reported in January that it obtained purported records detailing drug purchases by Rodriguez, Cabrera, Cruz and former AL Cy Young Award winner Bartolo Colon. Yahoo Sports reported that Braun, the 2011 NL MVP, was mentioned in the records. Most have denied the Biogenesis link, although Rodriguez has admitted using performance-enhancing drugs earlier in his career and Colon and Cabrera each were suspended for 50 games last year for testing positive for elevated testosterone levels. 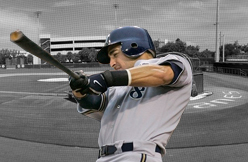 Braun failed a drug test in 2011, but his suspension was overturned by an arbitrator. He has acknowledged that he was mentioned in Biogenesis records because his lawyers had used Bosch as consultant during the appeal. After the Brewers' 4-3 win in 10 innings over Oakland at Miller Park, Braun said he was done talking about the clinic. "I've already addressed everything related to the Miami situation. I addressed it in spring training. I will not make any further statements about it," he said. "The truth has not changed," he said. Braun said the speculation was not affecting him on the field. "No, of course not. I've dealt with this for two years now. I'm pretty good at avoiding distractions," he said. LANHAM, Md. (CBSDC) — Four men will stand trial for the shooting death of former Washington Redskins safety Sean Taylor beginning in August. Taylor was shot in the leg during by armed intruders during an attempted robbery of his Florida home in 2007. He underwent surgery to repair damage to his femoral artery, but would eventually succumb to his injuries. Timothy Lee Brown, Jason Scott Mitchell, Eric Rivera, and Charles K. Wardlow face first-degree murder and armed burglary charges in connection to the shooting. The defendants could be sentenced to life in prison if convicted. Venjah Hunte, who pleaded guilty to degree murder in 2009, is expected to testify against the defendants. He is currently serving a 29 year prison sentence. 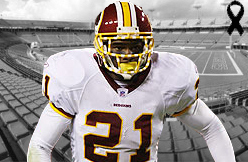 The Redskins selected Taylor with the fifth overall pick in the 2004 draft. He was elected to the Pro Bowl in 2006 and posthumously in 2007. He was 24 at the time of his death. GREEN BAY – Sam Shields didn’t get what he wanted, but the Green Bay Packers fourth-year cornerback said Tuesday that he’s ready to get to work. Shields had hoped for a long-term contract from the Packers as he held off on signing his restricted free-agent tender, but as the team’s mandatory minicamp got closer, he realized it wasn’t going to happen and signed the one-year, $2.023 million deal Monday – in time to participate in Tuesday’s practice. “That was one of my goals. It didn’t work out. I signed the tender and came back to minicamp. If I have a great year this year then it will speak for itself,” Shields said after practice Tuesday. “(There was) a little progress (on a long-term deal) but it didn’t happen. So I signed the tender and got back to work. "I’m not that guy like, ‘I’m not coming ‘cause I didn’t get paid.’ I need to get paid, but business is business. I wanted to get paid. It didn’t happen. I came and signed the tender and I’m here now. “I wanted to be back. I was tired of being home. I was home too long. I was just ready to sign the tender. I didn’t get what I wanted. I was like ‘it’s not going to go that much farther so I might as well sign the tender and get back." Shields worked on a limited snap count in practice Tuesday, as did defensive end Johnny Jolly, who also made his offseason debut after missing OTAs while finalizing his legal issues in Houston. Shields said he was at home in Florida until Sunday, when he arrived in Green Bay. His agent, Drew Rosenhaus, came in on Monday and met with the Packers but a long-term deal didn’t happen. He said he hasn’t given up hope of getting a long-term deal during the season. “You never know. It’s all on me. I’ve got to go out there and ball out. Do what I’ve been doing and it speaks for itself,” Shields said. “It was getting there, but then it wasn’t. Then, it was like, ‘Minicamp’s coming up, (I) might as well get back and sign my tender.’ Get back on the field. I didn’t want to be home too long. I was getting aggravated with my family. That happens with family, not just the family but everyone around you. I’m happy to be back and ready to rock and roll. Jimmy Graham is coming off a down year. At least, by his crazy standards. Graham finished 2012 with 85 catches for 982 yards and nine touchdowns for the New Orleans Saints. Strong numbers, no doubt, but well off the production of his 2011 season, which was one of the greatest ever had by a tight end. Graham wants to get back to that level. "I'm a hungry player. And this is probably the hungriest I've ever been, to kind of right the wrong of last year, to prove what this team can do and maybe hush up some of the naysayers," Graham said Tuesday, according to The Times-Picayune. "So for me, it's all work and doing as much as I can to be the best player I can." A wrist injury plagued Graham all of last season, certainly playing a role in his issue with dropped passes. Graham said he's feeling like himself again after surgery in January. "Everything's going well," Graham said. "I've been in rehab and I've been getting stronger. Right now, I'm almost 100 percent, so going into camp I'll be 100 percent. And it just feels good. It feels good to be healthy finally and to be back playing like me." Look out for Graham. He's healthy and motivated, and he's already proved what he's capable of when he gets locked in with Drew Brees. Don't be surprised if he is the game's most productive tight end in 2013. Word around the Eagles last week was that safety Kenny Phillips would be participating in the team’s minicamp this week after missing most of the team’s recent OTAs in order to rest his oft-injured right knee. Those reports were proven correct on Tuesday when Phillips joined his Eagles teammates on the field for practice. Phillips, who left the Giants as a free agent this offseason, said that he didn’t feel like he’s fallen behind when it comes to comprehending a new defense and insisted that his absences have been cautionary rather than the result of any current issue with his knee. Phillips is certainly right that there’s no reason to push things too far in May, but his confident words about the knee won’t do much to ease concerns that the knee will continue to be a problem for him come the regular season. 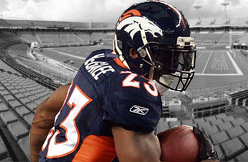 Denver Broncos RB Willis McGahee (knee) is expected to attend the team's mandatory minicamp next week. McGahee has been absent from organized team activities not due to his contract but because he's dealing with personal matters. McGahee has been taking part in offseason conditioning after tearing a ligament in his right knee in November of last season. Fantasy Tip: McGahee's health will be the ultimate deciding factor in whether the Broncos elect to keep him over Knowshon Moreno this year. If McGahee proves to be fully healthy and beats out Moreno for the No. 1 running role in Denver, he should be considered at least a solid No. 3 back heading into the season. As the son of one of pro football’s all-time greats, Jarrett Payton has had the unique opportunity to meet many other outstanding players during his lifetime. Yet Payton never has taken that privilege for granted. Representing his late father, Walter Payton, during this week’s Pro Football Hall of Fame “Salute to Greatness” events in Glenview has provided Jarrett with the ability to chat with 17 Pro Football Hall of Fame players. A dinner Monday night and golf outing on Tuesday at the Glen Club have helped raise money for the Make-A-Wish Foundation. “To me it’s actually an honor to have an opportunity to be in a room with all of these legends,” Payton said. “I think a lot of people really don’t understand that these are some of the greatest athletes to ever play sports. Last night, seeing Kellen Winslow and Anthony Munoz and guys like Warren Moon … these are guys I looked up to growing up." Jarrett Payton starred at the University of Miami before playing briefly in the NFL and the Canadian Football League. He also played in NFL-Europe. He said he was proud to represent his father in this event because of Walter’s extensive involvement in charity events. “A lot of these guys have the opportunity to really use football as an avenue to help their lives and their families. To see them giving back to the community and all of the great things that Make-A-Wish does." 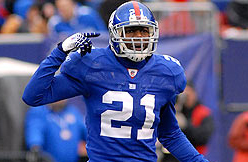 New York Giants safety Antrel Rolle never has been shy about speaking his mind. His latest targets are Dallas Cowboys coach Jason Garrett and owner/general manager Jerry Jones. In an interview that aired Tuesday on NFL Network's "NFL Total Access," Rolle said he's "looking forward" to playing against a team that some analysts already are picking to win the NFC East this coming season. 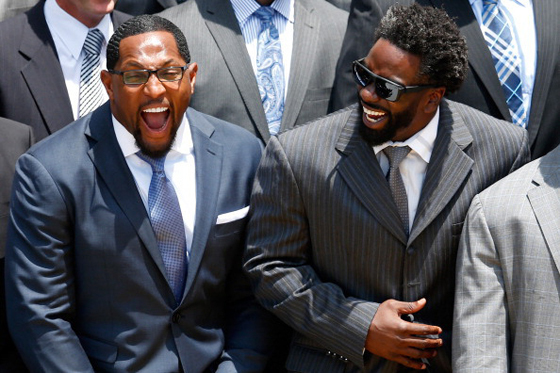 "The Dallas Cowboys are a good team," Rolle said. "Maybe they're missing a couple pieces of the puzzle, but I don't think the pieces they're missing are actually the players." Ouch. That's a not-so-subtle shot across the bow of the Cowboys' brass. Jones isn't one to hold back, either. It will be interesting to see a retort after last year's admission that he deserved to be fired as general manager. Jones since has promised a "very uncomfortable" offseason in response to two uninspiring 8-8 campaigns under Garrett's watch. Now that offensive coordinator Bill Callahan is taking over play-calling duties, it will be easier for Jones to jettison Garrett in-season if the Cowboys get off to a slow start. 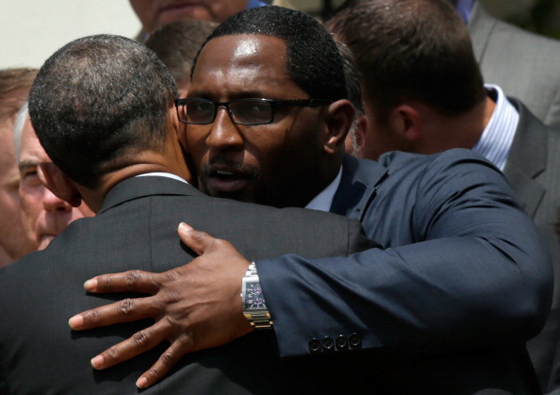 Rolle's comments directed at NFC East foes weren't all negative. Asked about Washington Redskins quarterback Robert Griffin III, Rolle replied: "I'm not so eager to see this guy. I'm gonna let him take his time, get his rehab. I want him 100 percent. He's a huge playmaker in this league." The Giants might believe the Cowboys are something of a laughing stock, but it has become abundantly clear that they have the utmost respect for Griffin. Miami point guard Shane Larkin tops the list of six players who will participate in a pre-draft workout for the Jazz on Wednesday morning at the team’s practice facility. Larkin, the son of baseball Hall of Fame shortstop Barry Larkin, is a 5-foot-11 point guard who is projected to be selected in the middle of the first round of the draft on June 27. The Jazz own the No. 14 and No. 21 picks in the first round. They also own the 46th overall pick in the second round. Larkin averaged 14.5 points, 4.6 assists, 3.8 rebounds and shot 40.6 percent from the 3-point line last season, when Miami won the Atlantic Coast Conference and advanced to the Sweet 16 in the NCAA Tournament. In a regular-season win over top-ranked Duke, he scored 18 points, grabbed 10 rebounds and handed out five assists. Larkin does not turn 21 until Oct. 2. He opened eyes of NBA scouts in Chicago recently when his vertical leap was measured at 44 inches — second-best in the history of the combine. This week, reports surfaced that Boston hopes to draft Larkin as a backup to All-Star point guard Rajon Rondo. The Celtics own the 16th pick in the draft — two spots behind the Jazz. Chris Tillman pitched a very solid seven innings, Danny Valencia homered and Nate McLouth manufactured a run on the bases as the Orioles beat Houston, 4-1, tonight to start a three-game series and six-game road trip. The win was the Orioles' fifth in six games and 10th in the last 14. They also snapped Houston's six-game win streak. The Orioles are 18-12 on the road and 33-25 overall. The O's took a 2-0 lead in the third. Valencia hit an opposite-field homer to right. It's his third of the season and third over his last seven games and 17 at-bats. Later in the inning, Manny Machado picked up his big league leading 26th double and then scored on an error. The Orioles picked up big insurance runs in the eighth and ninth. McLouth singled and then stole second and third in the eighth and came home on a throwing error by catcher Jason Castro. McLouth is 21-for-22 in steals this season. In the ninth, J.J. Hardy doubled with two outs and scored on a Ryan Flaherty single. Padres shortstop Everth Cabrera and catcher Yasmani Grandal are among 20 players being targeted for possible suspensions by Major League Baseball, according to ESPN. The network is reporting a breakthrough in MLB's investigation into a Miami anti-aging clinic that has allegedly provided performance enhancing drugs to players. Foremost on the list of 20 players reported to be facing possible suspension are two former Most Valuable Players, third baseman Alex Rodriguez of the New York Yankees and outfielder Ryan Braun of the Milwaukee Brewers. Their names alone suggest an investigation revealing perhaps the biggest drug scandal in baseball history. This in a professional sport where former superstars who obliterated most of the significant power-hitting records were alleged to have been using performance-enhancing substances in the late 1990's and early 2000's. That was prior to the institution of MLB-wide testing for steroids and other PED's in major league baseball. If he is indeed among the players subject to punishment, Grandal could be hit with a 100-game suspension because he recently came off a 50-game suspension for his failed testosterone test late last year. MLB might consider this a second offense. Cabrera's name was also reportedly linked to paperwork found at Biogenesis of America, the South Florida clinic whose owner reportedly is going to cooperate with an investigation into the involvement by major league players. He would likely receive a 50-game suspension as a first-time offender. "I haven't heard anything," said Cabrera before Tuesday night's game against the Los Angeles Dodgers in L.A.. "I haven't seen any report. I don't know anything about this." 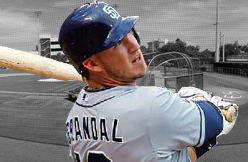 Grandal, a former University of Miami player traded from the Cincinnati Reds to the Padres before the 2012 season, tested positive at the end of last year and has steadfastly refused to discuss details of his involvement. Even as he was about to begin serving his suspension for the first 50 games of the regular season, a Major League Baseball source told U-T San Diego that Grandal could be considered a two-time offender if the Biogenesis investigation revealed more participation on his part. Cabrera has been enjoying a breakthrough season at the age of 26, receiving mention as an All-Star Game candidate with his play as the Padres' switch-hitting leadoff. He leads the major leagues with his 23 stolen bases, boosting his batting average to .276, and tops the Padres in hits and on-base percentage. Alex Rodriguez, Ryan Braun and other players connected to the PED scandal at the Miami-area Biogenesis clinic could be suspended soon by Major League Baseball, according to a new ESPN "Outside the Lines" report. One source familiar with the case said the commissioner's office might seek 100-game suspensions for Rodriguez, Braun and other players, the penalty for a second doping offense. The argument, the source said, is that the players' connection to Bosch constitutes one offense, and previous statements to MLB officials denying any such connection or the use of PEDs constitute another. Bosch and his attorneys did not return several calls. MLB officials refused to comment when reached Tuesday. Bosch is expected to begin meeting with officials — and naming names — within a week. The announcement of suspensions could follow within two weeks. Investigators have had records naming about 20 players for more than a month. But without a sworn statement from Bosch that the records are accurate and reflect illicit interactions between the players and the self-described biochemist, the documents were little more than a road map. This could be a league-shaking development. Among the players already connected to Biogenesis through documents leaked to the Miami New Times, Yahoo! Sports and ESPN: A-Rod, Braun, Melky Cabrera, Bartolo Colon, Yasmani Grandal, Nelson Cruz, Francisco Cervelli, Jesus Montero, Jhonny Peralta and Everth Cabrera. Other players could still be linked to Biogenesis through Bosch's testimony. In exchange for Bosch's full cooperation, sources said, Major League Baseball will drop the lawsuit it filed against Bosch in March; indemnify him for any liability arising from his cooperation; provide personal security for him and even put in a good word with any law enforcement agency that may bring charges against him. Sources said negotiations over the agreement, which lasted several weeks, stalled over the last point, as Bosch wanted the strongest assurances he could get that MLB would help mitigate any prosecution. Stay tuned. We certainly haven't heard the end of this. 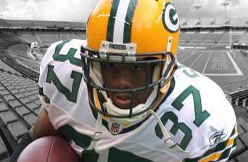 Earlier, we noted the 2013 financial dilemma facing Green Bay Packers cornerback Sam Shields. Should he play this season under the terms of his $2.02 million restricted free-agent tender, or should he push hard -- presumably via skipping the offseason program -- for a long-term deal now? It appears the sides have reached a compromise, at least for now, following a reported face-to-face meeting between agent Drew Rosenhaus and team officials. Shields signed his tender, according to ESPN's Adam Schefter and others, clearing the way for him to participate in this week's mandatory veteran minicamp. The decision could be interpreted in a variety of ways, but for now it's a good-faith move from Shields. There is nothing preventing the sides from continuing negotiations on a long-term deal if they want. The Packers, of course, have plenty of options at the position in Tramon Williams, Casey Hayward and Davon House. At the very least, however, they can now get a look at all of them during the remainder of the offseason program. Last season, Shields intercepted three passes during the regular season and two more in the playoffs, including one he returned 52 yards for a touchdown against the San Francisco 49ers. A shin injury forced him from six games, however, and he played on only 53.9 percent of the Packers' defensive snaps. 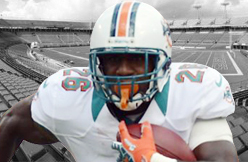 We knew as far back as February that the Miami Dolphins were giving Reggie Bush the cold shoulder because they believe 2012 fourth-round draft pick Lamar Miller can be a bigger, faster, better version in this year's backfield. Although Dolphins coach Joe Philbin recently described the running back competition as "wide open," those close to the team understand that Miller is the runaway leader. Appearing on NFL Network's "NFL Total Access" on Monday, Dolphins quarterback Ryan Tannehill stated without equivocation that Miller is well ahead of 2011 second-rounder Daniel Thomas and rookie Mike Gillislee. Asked who the Dolphins' starting running back is, Tannehill replied without hesitation: "Lamar Miller right now. He's doing a great job this offseason, really has a great handle on the offense and he's doing a great job protecting. ... They can (all) run the ball but being able to understand the pass game, understand the checkdowns and where they're protecting really makes a big difference and makes me more comfortable." Fantasy leaguers take note: With deep-threat option Mike Wallace on the scene to keep extra defenders out of the box, there isn't a better breakout candidate than Miller this season. 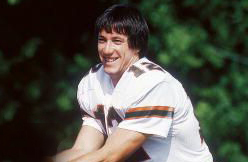 BATAVIA, N.Y. -- Buffalo Bills Hall of Fame quarterback Jim Kelly says he has been diagnosed with cancer in his upper jaw bone and will have surgery on Friday. Kelly is suffering from squamous cell carcinoma, but he has recently undergone tests to show that the cancer is isolated in his jaw and has not spread to other parts of his body. "The past couple of weeks have been difficult for me," Kelly said. "Because of the nature of social media, I thought it would be best to share with everyone what has been going on with my health." The announcement was made Monday morning, just before the start of the quarterback's Kelly For Kids charitable foundation's annual celebrity golf tournament. "Doctors have told me that my prognosis for recovery is very good," he said. Kelly will have part of the upper jaw removed, and he is unsure whether he will require chemotherapy, which will be determined after surgery. The operation will be performed in Buffalo. "We caught it in time," Kelly said. "When you hear the word 'cancer,' it automatically scares you. It not only scared me, but my family. But it's like everything. It's another river to cross, another stumbling block. I've been to the top many times. And I've been to the bottom. It's just one of the roller coaster rides I've been on throughout my life. "It's just another challenge for me and I know I'll beat it." Kelly spent 11 seasons with the Bills before retiring following the 1996 campaign. He still holds nearly every significant career franchise passing record -- 35,467 yards, 237 touchdowns and 26 300-yard games -- and was inducted into the Pro Football Hall of Fame in 2002. "I am extremely confident in my road to recovery," Kelly said. "I plan to tackle this challenge head on, as we Kellys always do, with toughness, perseverance and faith." Concerns about the 53-year-old's health were first raised last week when his wife, Jill Kelly, posted a message published on imgur.com. Without going into detail, Jill Kelly noted that the family was going through a "more serious battle under our roof," and asked followers to pray for her husband "for healing." Later, a youth sports foundation in Sioux Falls, S.D., announced that Kelly would not be able to attend the Hy-Vee/Sanford Legends banquet on June 13 for personal reasons. Jill Kelly noted the cancellation with a post on her Twitter account on Friday in responding to a person disappointed the quarterback won't be attending the banquet. "He is disappointed as well," Jill wrote. "But his health must come first! Please pray for him "
Jim Kelly has encountered numerous health problems over the past few years, and has had surgery to correct back, neck and hernia problems. Then, in mid-March, Kelly revealed in an interview with the State Journal-Register of Springfield, Ill., that he recently had surgery to remove a cyst -- which he's described as being "the size of a nickel" -- from his gums and nasal cavity. As part of the operation, doctors had to pull out his front teeth, Kelly said. Kelly appeared to be having no setbacks in his recovery, after making numerous public appearances over the past month. Kelly was in good spirits attending rookie quarterback EJ Manuel's first news conference at the Bills' facility on April 26, a day after Buffalo selected the player in the first round of the draft. Two weeks ago, Kelly watched a Bills practice session from the sideline, after which he chatted up several players. On May 26, Kelly joined country music artist Tim McGraw on stage and threw footballs into the crowd during a concert outside Buffalo. Jill Kelly posted photos of her husband with McGraw, as well as her husband attending The Preakness in Baltimore on May 18. Jim Kelly was upbeat in addressing reporters on Sunday, while attending his charity's annual gala and auction, noting that his 84-year-old father, Joe, was in attendance. He said this year's event was projected to raise close to $5 million. And he noted how this was an opportunity to see many friends and former teammates. "Jim's a fighter. We think he'll be OK. We're all in his corner," former Bills receiver Andre Reed said. "He's such a resilient guy, and that's been our motto forever, in whatever we did. The Kelly for Kids Foundation was established in 1987, and has since donated tens of millions of dollars to numerous organizations around the region. Kelly later founded the Hunter's Hope Foundation in honor of his son, Hunter, who was born in 1997 with Krabbe disease. That's an inherited degenerative disorder of the central and peripheral nervous systems. The disease hinders development of the myelin sheath, a fatty covering that protects the brain's nerve fibers. Given little more than three years to live, Hunter died at the age of 8 in 2005. I would like to see more of Adrian Tracy and Adewale Ojomo. 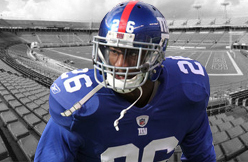 Do you think they will get more playing time on the field this year now that Osi Umenyiora is gone? It would be nice to use these newer guys more. Frankly, I don’t see them getting much more time. Mathias Kiwanuka is once again listed as a defensive end on the roster. Assuming Justin Tuck and JPP are the starters, Kiwi will be the third end. That’s a strong rotation, but it would limit the opportunities for Tracy and Ojomo. Tracy did good work with limited playing time last year and will get a chance in training camp and the preseason to show he’s improved. Ojomo led the Giants in sacks in the 2012 preseason. But with third round draft choice Damontre Moore also here and certain to make the roster barring an injury, Ojomo is longshot to get significant playing time this year. Lamar Miller, RB, Miami Dolphins: Miller carried the football a mere 51 times as a rookie, but he showed some flashes of potential with a solid 4.9-yards-per-carry average. 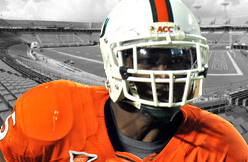 With Reggie Bush now in Detroit, the Miami (FL) product is in a great spot to take over the No. 1 role in the backfield for coach Joe Philbin. He also has the best schedule among running backs based on fantasy points for 2013. In a best-case scenario, Miller could turn into a legitimate No. 2 fantasy runner. 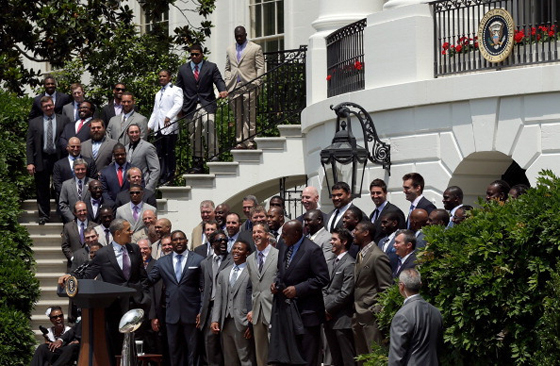 The 2012-13 Ravens will be well represented Wednesday when the team travels to the White House to be honored by President Barack Obama for its 34-31 victory over the San Francisco 49ers in Super Bowl XLVII on Feb. 3. 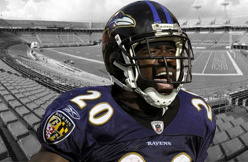 Linebacker Ray Lewis, who retired following his 17th season in Baltimore, and safety Ed Reed, who signed a free-agent deal with the Houston Texans in March after playing 11 seasons for the Ravens, are both expected to attend the festivities, which include a private ring ceremony on Friday at the Under Armour Performance Center in Owings Mills. Reed had hip surgery in April and hasn't been able to participate in workouts with his new team. Reserve linebacker and special teams standout Brendon Ayanbadejo, who was released this offseason, also is scheduled to attend along with the majority of the current Ravens who were on last year's Super Bowl roster. The Ravens have their third and final session of organized team activities this week so a good part of the team is already in town. However, there will be some noticeable absences, a list headed by wide receiver Anquan Boldin who was traded to the San Francisco 49ers in March. 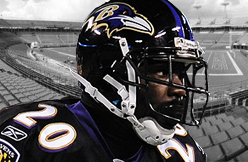 Boldin will stay in California to participate in OTAs with his new team, confirmed a Ravens' official. "Unfortunately I'm going to miss a great opportunity to be with my Super Bowl team at the White House," Boldin said on his Twitter account. "I know those guys will proudly share our Super Bowl memories and unforgettable moments on my behalf." Safety Bernard Pollard, now on the Tennessee Titans after being released by the Ravens, and linebacker Paul Kruger, who signed with the Cleveland Browns early in free agency, also won't be in attendance at the White House. Kruger, the Ravens' sack leader last year, is expected to attend Friday's ring ceremony. Reserve safety Sean Considine, now a free agent, has a family obligation that will keep him from attending. According to the Philadelphia Inquirer, Eagles quarterback Dennis Dixon, who was on the Ravens' practice squad for much of last season, and cornerback Cary Williams will also not attend the White House event. The Eagles have a minicamp this week and Williams, who started every game last year for the Ravens, has already gotten some criticism for missing some of the team's voluntary workouts under new coach Chip Kelly. The Celtics could draft a point guard with the No. 16 pick in the June draft. Beat writer Gary Washburn writes "don't be surprised" if the Celtics "nab a point guard," and he specifically references Shane Larkin as a possibility to backup Rajon Rondo. Although the Celtics desperately need size, they also need a backup point guard badly, something that was obvious to anyone watching the team after Rondo went down last season. Washburn also notes Dennis Schroeder, a German point guard, is in the mix. LOS ANGELES -- Yonder Alonso was out of the Padres starting lineup again on Monday, but manager Bud Black is hopeful his first baseman will be available at some point during this week's three-game series at Dodger Stadium. Alonso was hit in the hand in Friday's game against the Toronto Blue Jays. He exited with a right hand contusion and hasn't played since. "He's getting close," Black said. "We're hoping tomorrow or the next day. ... He's feeling better. It's all about his grip strength, and that's improving. He's still getting a lot of treatment." Alonso is hitting .284 with six homers and a .751 OPS this season. Perez (shoulder) will resume throwing "in about three days," according to manager Terry Francona, the Cleveland Plain Dealer reports. "Perez got a real good examination [Sunday]," Francona said. "We'll give him a few more days without throwing, but again it was a real good examination." Though Francona didn't elaborate on what exactly made the examination encouraging, it's positive news regardless. The right-hander was shut down early this week, and it sounds like it did wonders for Perez's shoulder pain. Barring setback, Perez should begin to ramp things up in the near future. With Peyton Manning out of the picture, nobody knew what to expect from Reggie Wayne of the Indianapolis Colts during the 2012 season with Andrew Luck taking over under center as a rookie, but the wide receiver looked just like his old self as he finished the year with 106 catches for 1,355 yards and five touchdowns. Now that Luck has a season of experience under his belt, expectations will be high once again for Wayne heading into the 2013 season and even at 34 years of age–there’s no reason why Wayne shouldn’t be able to post big numbers once again. One of the best things about Wayne is he’s been one of the most consistent wide receivers in the league throughout his career as he’s recorded at least 1,100 receiving yards in seven of his last nine seasons. Many expected Wayne’s numbers to decline for at least the 2012 season and he and Luck adjusted to playing together, but that was obviously far from the case as the duo played a key factor in helping Indianapolis make a playoff run–which nobody expected. With the type of numbers he’s displayed over his career, there’s no reason why Wayne shouldn’t come through once again next year and as scary as it sounds–the Colts could be even better than they were in 2012. Of course, whether or not that actually happens may rely heavily on what type of production they receive from Wayne–which should be good assuming he manages to stay healthy. TAMPA, Fla. – They never seem too distant, one running back entering a new career phase and the other beginning his. Doug Martin, after a stellar rookie year, is the Tampa Bay Buccaneers’ future at the position. But he sees parts of himself in rookie Mike James. That is why Martin is quick to offer praise for the Miami product, taken in the sixth round, 189th overall, when given the chance. These are early days of relationship building between draftees and their teammates, a time when advice is given and impressions are made. Growth happens. Late Wednesday morning, Martin stood near a practice field after an OTA session at One Buc Place and considered his evolution. A year ago, Martin lived James’ situation, fresh out of Boise State as the 31st overall pick. 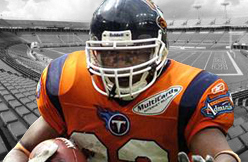 He became one of the NFL’s most prolific rushing talents, earning 1,454 yards and 11 touchdowns on 319 carries. He matured into an answer. Now, Martin is eager to help with any questions. James’ selection, as it relates to Martin, stands as a contrast to another Tampa Bay draft choice: quarterback Mike Glennon, a third-round pick (73rd overall). Many outside the region view Glennon as a threat to starter Josh Freeman. Coach Greg Schiano and general manager Mark Dominik, however, have said this is the incumbent’s team. There is little reason to think Freeman will lose his job this fall if he stays healthy. Still, perceptions (false or not) take on their own life in a high-speed age. Assumptions involving quarterbacks have a long existence. This development is not exclusive to the Bucs, see: Aaron Rodgers and Brett Favre with the Green Bay Packers or Geno Smith and Mark Sanchez with the New York Jets. Post-draft “controversy” is predictable. It will occur again. Yet for many reasons, James’ selection is seen as a benefit for Martin. The two players are similar in their demeanors: humble, soft-spoken, committed to improve. It is easy to picture their working relationship growing into a scenario that enhances both. There is room for him to do so. Martin hopes to improve as a pass catcher and fine-tune his route-running skills. As part of an offense last year that averaged 24.3 points per game (13th overall), he finished third on the team with 472 yards with one touchdown on 49 catches. His vision as a rusher is there, advanced for a 24-year-old. Now, he can work to become more dynamic. This is a personal challenge, but part of that responsibility will fall on Schiano and his staff. Martin’s task ahead is two-fold: (a) Gain a deeper grasp of his role from running backs coach Earnest Byner and (b) preserve his health. Along the way, he can be a giver and mentor James. Along the way, he can become more complete. "Oh, man, the talent's amazing," James said, shortly after drafted. "You've seen the games. It's amazing. I'm just glad to be a part of it. I'm just happy to be a part of it." That enthusiasm is similar to what Martin lived last spring. Unlike the strange tension following Glennon’s selection, James’ arrival offers positives: A chance for Martin to grow in a different way, as a mentor, as a guiding presence without the chatter that lingers for Freeman when Glennon is discussed. Granted, the quarterback and running back positions in the NFL are different beasts. The spotlight is hotter behind center. Still, the contrast is revealing. All part of Martin’s evolution. All part of growth in the game. 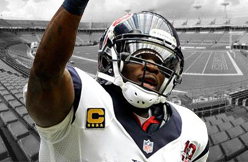 Coach Gary Kubiak promises the Texans will continue to run a high percentage of their passing offense through Andre Johnson. In 2012, Houston was one of just four NFL teams to target one receiver more than the rest combined (58.1 percent). Asked about the 58.1 percent target rate, Kubiak replied "Tell them a big percentage is going to go through him again. It's going to happen again." Johnson will continue to be the No. 1 read on the heavy majority of Matt Schaub's dropbacks, which is great for fantasy value. 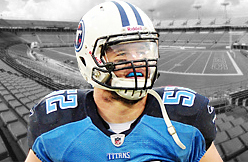 Titans MLB Colin McCarthy is now working behind Moise Fokou at OTAs. Fokou took first-team reps during Friday's practice, while McCarthy ran with the twos. This impending training camp battle is far from settled, but it's a reminder that McCarthy lacks job security after struggling throughout 2012. There were plenty of wide eyed young football players in Belle Glade on Saturday morning, as Baltimore Raven running back and Super Bowl Champion Damien Berry returned home for his inaugural Football Camp. Berry, along with several current and former NFL stars, helped the kids work on their football skills, with the overall goal of inspiring them in their lives. "There are a lot things that transpire in our lives which put us in different places," said Damien Berry, "opportunity is one of them. When given the chance you must take the initiative, embrace it and do your best to accomplish your goal. With God first, and family you can strive to make it a reality." The Grace FLY Youth Foundation was founded by Damien's father Kenny Berry, and according to a statement it's "mission is to empower the youth of Palm Beach County through its outreach programs". "There's a better way," says Kenny Berry, " and what they see out in Belle Glade, that's not the whole World. Not everyone's gonna make it in football, so you have to have something to fall back on, and that's what the Grace Fly Youth Foundation is about." In a piece now posted on NFL.com, Adam Schein shares his viewpoint on the 10 most indispensable defensive players in the NFL, and there is one Patriot on the list -- Vince Wilfork. Entering his 10th NFL season, Wilfork lands at the No. 7 spot. "At age 31, he's still elite. He got my vote last year for first team All-Pro at defensive tackle [along with Geno Atkins]," Schein writes. "Wilfork is a pro's pro, consistently fulfilling his duty of clogging the middle. 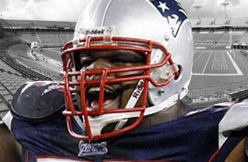 Wilfork is a leader, a true Bill Belichick guy. He can play [and dominate] in multiple fronts. The Patriots have many issues/questions on defense, and they would be magnified without Wilfork." Wilfork's place on the list is well deserved from this perspective, and one aspect of his career that stands out is how he's evolved from more of a two-down player to a three-down option in 2010. In years eight and nine of his career, he has logged more snaps than ever before. One question to consider for 2013 is if keeping Wilfork at such a high snap-count total is a good idea -- both for him and the team. Wilfork has shown no signs of slowing down, but might it preserve another year of his career if the numbers were closer to around 75 percent? The Patriots trimmed some of their defensive tackle depth by releasing Brandon Deaderick and Kyle Love, so if the club is thinking along those lines, it highlights the importance of players such as Tommy Kelly, Armond Armstead, Marcus Forston and Co. making notable contributions. Outside of Wilfork, the defensive tackle position has almost completely changed in 2013. MISSISSAUGA, Ont. - Receiver Mike Williams, a former NFL first-round draft pick, was among three players released Friday by the Toronto Argonauts. Also let go were running back Shawnbrey McNeal and offensive lineman Josh Prinsen, who played his college football at Queen's. 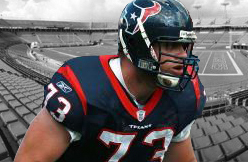 The six-foot-five, 241-pound Williams played at the University of Southern California and was selected 10th overall by the Detroit Lions in the 2005 NFL draft. Williams, 29, spent five seasons in the league with Detroit, Oakland and Seattle, registering 127 catches for 1,526 yards and five TDs in 56 career games before being released by the Seahawks on July 13, 2012. Willis McGahee is a veteran player, headed into his 11th season, who simply prefers to work out in Miami in the offseason — much like he did last year during the Broncos' organized team activities (OTAs). Personnel people around the league will consistently say players who played in collegiately at Miami (Fla.), are natives of Miami, or both, have traditionally been among the players who stay away the most from offseason workouts. In short, the players like being in Miami in the winter/spring and prefer to work out at the University of Miami. It's a generalization, sure, but it is something personnel folks around the league have said over and over again. In some ways the coaches have only themselves to blame for all that by consistently ramping up the offseason commitments until it became one of the biggest topics of negotiation in the current labor deal. Now, that said, most players would say even with the decrease in workouts and the amount of time on the field, the workouts are anything but voluntary. That if you really want to play, the expectation is that you have to be in the team's building in the offseason program. But after McGahee's limited participation in the offseason program last season he still entered training camp, and then the regular season, as the Broncos starter. so, if you can play, in shape (and McGahee was) and they think you're the best option at the position, things work themselves out. McGahee was hoping the Broncos would re-do his deal at least some after 1,199 yards rushing in 2011, but the Broncos held fast and didn't tweak his original four-year contract that still has two years remaining on it. The deal was worth $9.5 million overall, including a $2 million signing bonus. McGahee, who will turn 32 this season, is scheduled to earn a $2.5 million base salary this season and a $2 million base salary in 2014. McGahee also suffered a torn medial collateral ligament and compression fracture of his right knee early in the second quarter of the Broncos' 30-23 victory over the San Diego Chargers this past season. He went on injured reserve at that point, but the Broncos left open the possibility he could return to the AFC Championship Game. And as much as McGahee lobbied the coaches and training staff — and he lobbied plenty — to play in the Divisional Round loss to the Ravens, the Broncos didn't think he was physically ready to return at that point and he was not activated. McGahee has had spotty attendance in the Broncos conditioning workouts this year and has not attended the first set of OTA workouts over the last two weeks. The Broncos have four OTA workouts — all voluntary — this week as well, but McGahee is not expected at this point. Ronnie Hillman has lined up with the starters in McGahee's absence. He is expected to be in the team's Dove Valley complex for mandatory minicamp — players formally report for that on June 10. If he doesn't show then, it probably becomes an issue for the team at that point. Even with his experience McGahee will certainly be behind in terms of learning offensive coordinator Adam Gase's tweaks to the playbook and he has allowed players like Hillman and rookie Montee Ball to use the time to show what they can do as younger, and financially cheaper in terms of the salary cap, options at the position. "I have taken Montee after practice each day and just kind of going through plays, going through games, getting him comfortable hearing audibles at the line of scrimmage. Because we are going to count on him in a big way this year. He's a rookie, but coach (John) Fox is not going to bring him along slowly. We are going to put him in there and make him a contributor this year." If McGahee does come to the Broncos minicamp, as expected, later this month, it will be intriguing to see how the Broncos line him up and where he fits in the pecking order at that point. But given his age and the fact the Broncos have used third- and second-round picks on running backs in the consecutive drafts, it is a calculated risk on his part. On June 3, I will be representing my father, Walter Payton, at a Pro Football Hall of Fame dinner at The Glen Club in Glenview. I will be surrounded by 17 Hall of Famers, all of whom will be in town to raise money for the Make-a-Wish Foundation of Illinois and to promote the positive values of sports — values that were once instilled in me by my dad. When I was growing up, he constantly stressed the importance of hard work, studying the game and practicing until perfection. These values have helped me immeasurably throughout my life — and to do something at age 12 that no child had done before me. Twenty years ago this August, I inducted my father into the Pro Football Hall of Fame. My dad told me what I was doing 2 ½ months before we were to go to Canton, Ohio, for the ceremony. I didn’t understand the magnitude of what he was asking. The first time I understood was when the Hall sent books to our house that showed an aerial shot of the thousands of people who attend the ceremony. That’s when I realized that this was no joke. This was not getting up and speaking in front of your sixth-grade class. The speech I ended up giving was written by Ms. Luna, our longtime housekeeper. I would sit at our kitchen island in our house on Mundhank in South Barrington and practice, practice and practice. The week leading up to the big day was filled with activities. My dad was constantly being pulled in different directions, but he always made time for the two of us. One day, after signing hundreds of footballs, my dad and I drove around and found an arcade — no matter what city we were in, my dad and I would always find an arcade and lose ourselves in father-son time. I still remember the actual ceremony to this day. When my dad reached the podium, he started to cry. It was the first time I ever saw him cry. He said it was because he was proud of me. As I got older, my dad continued to teach me to study the game of football. People may think of him as a constant workout monster — he was known for running hills — but he actually watched more film than anything else. He would sit in our basement with old reels of film from either his games or an upcoming opponent, and he’d watch over and over again, studying every play. In 1997, during my junior year at St. Viator, I finally started playing football. My dad would tape all of my games. He wouldn’t sit in the stands; he would take his own video camera and climb way up onto the top of the press box so he wouldn’t be distracted. It was pretty high up, and sometimes he would just sit by himself, through cold weather, rain or wind. I know that the Hall of Famers coming to Chicago made it there by studying the game like my dad did. I can’t wait to shake hands with all of them, and to share stories about my dad. As Father’s Day approaches, I think about that special week in Canton that we had together. I’m so honored to be representing him yet again, and I hope I have a chance to shed a tear one day to show how proud I am of my own young son. The Pro Football Hall of Fame dinner and golf outing will be held Monday and Tuesday at The Glen Club, 2901 W. Lake, Glenview. For more information visit Profootballhof.com/chicago-salute-to-greatness.aspx. SAN ANTONIO — Dan Hughes wondered who would step up in the absence of his top two players, and the San Antonio Silver Stars coach got the answers he was looking for Saturday night. Shenise Johnson scored 19 points, Danielle Robinson had 18 and the Silver Stars overcame a big game from Candace Parker in an 83-78 victory over the Los Angeles Sparks on Saturday night. Parker had 27 points and 20 rebounds to lead the Sparks (1-1), who had won three straight against the Silver Stars. "A couple of times you could see we had to make a play," Hughes said. "We had to make a defensive play; we had to make an offensive play (and they did). This group is a new situation. Who do we play through, how do we work together? I was just pleased to see them handle that." San Antonio is without injured All-Stars Sophia Young and Becky Hammon. The Sparks pulled to 80-78, but Robinson was 4 for 4 on free throws in the final 30 seconds to seal the victory for the Silver Stars. She had missed two free throws with 54.4 seconds remaining after being intentionally fouled by Parker, but Hughes opted to continue playing through his third-year guard down the stretch. "I knew coming into this season that was going to be more of an expanded role for me, especially with Bec (Hammon) out," Robinson said. "You've got to be able to handle pressure, you've got to take it and enjoy it, and that's what I did tonight." Jia Perkins added 14 points and Danielle Adams had 12 points for San Antonio (1-1), which was swept by Los Angeles in the opening round of last season's playoffs. Lindsey Harding scored 18 points and Ebony Hoffman had 13 for the Sparks. With Johnson leading the way, San Antonio's bench outscored Los Angeles' 36-19 to rebound from a 79-64 loss in its season opener. "Coach, he murdered us this week (in practice) to be honest," Johnson said. "He murdered us and it showed on the court tonight. He was building our toughness. We came out and displayed that." The Sparks had difficulty defending the second-year guard, who went 8 for 13 from the field against a series of defenders. Johnson had 12 points in the first half, including an open 19-foot jumper after Jenna O'Hea stumbled trying to defend a cross-over dribble. "Shenise Johnson's ability to just go get buckets, for this just to be her second year in the league, she's playing like a vet," said DeLisha Milton-Jones, the former Sparks star in her first season with the Silver Stars. "If she can keep that aggressive mentality, it's going to benefit us in the end." Parker kept Los Angeles within striking distance with an active first half. 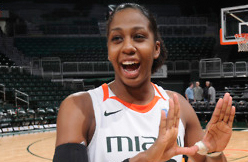 She had 14 points, eight rebounds and three blocks while playing 10 minutes in the first two quarters. One of the blocks came when the 6-foot-4 post ran down 5-11 Davellyn White from behind on a fast-break layup attempt. "Candace Parker is just a handful," Hughes said. "At least in that regard we made her take 22 shots, but she's just a hard guard in situations." Perkins scored the Silver Stars' first nine points as they raced to a 9-2 lead. Harding had a jumper and a 3-pointer during a 7-0 run, to take a 13-12 lead with 4 minutes left in the first quarter. Five different players scored as San Antonio opened the second half on 12-0 run that gave the Silver Stars a 57-52 lead. Harding's layup broke a nearly four-minute drought for the Sparks, and sparked a 13-0 run that pulled them to 57-55. "We were scoring, but so were they," Los Angeles coach Carol Ross said. "The tone was set in a negative way on the defensive end, and we were just in a fight and in scramble mode pretty much throughout the game." Hammon missed her second straight game with a broken right middle finger. She sported a purple cast while sitting on the bench throughout the game. The agent for Miami PG Shane Larkin said his client has no intention of working out for the Knicks. "We don't feel like he's going to be on the board when they select," agent Steve McCaskill said. The Knicks hold the No. 24 pick in the June 27 draft. They could use some point guard depth with Jason Kidd at 40 years old and Pablo Prigioni's future unclear. Larkin's stock rose a little at the Combine when he showed extremely well in the athletic drills. The negative is that he measured in at 5-foot-11 1/2 and 170 pounds. Trey Burke is considered undersized at 6-foot-1 1/4 and 187. 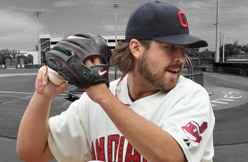 Cleveland Indians RP Chris Perez (shoulder) will be re-evaluated Sunday, June 2, before the team plans the next step in his rehab. Fantasy Tip: Vinnie Pestano will continue to hold down the closer's role in Perez's absence. Pestano should be owned in all formats while Perez is out. The fact that Pestano has regained some of his velocity is a good sign for those that are riding him out for save opps in the short term. Entering Sunday’s series finale with Detroit, the Orioles bench had struggled throughout the year in contributing late in games, hitting just 1-for-18 in pinch-hit situations. But against the Tigers, the Orioles got their first pinch hit since May 20 when Danny Valencia knocked in the tying run on a single to right field off Tigers reliever Phil Coke in the seventh inning. Before Valencia’s bloop single, Chris Dickerson was the last Oriole to notch a pinch hit. Dickerson singled against the New York Yankees on May 20 in a 6-4 loss. Valencia pinch hit in Saturday’s 10-3 loss, but he flied out to left field against Tigers reliever Drew Smyly. The 28-year-old has appeared in eight games this season and is batting .250 those appearances. Valencia’s day was just part of a solid performance by the Orioles bench. After his single, Alexi Casilla pinch-ran and scored the go-ahead run on left fielder Nate McLouth’s single up the middle. In the eighth, Casilla provided the Orioles insurance by doubling over the head of Tigers left fielder Andy Dirks to score first baseman Chris Davis. For the Orioles to keep up with their late-inning heroics — three of their past four wins have been comebacks — they’ll need the bench to contribute like Valencia and Casilla did Sunday.